I have been asked on a number of occasions about me, my interest in genealogy and my own personal family tree. So, to save me repeating it each time I am asked, here is a brief history. I was born Sandra Jacqueline Foskett in Southampton, Hampshire, England (the home of the Titanic) in 1943. I didn't start off to trace ancestors, but back in 1967 I became curious about the origins of a long-deceased grandfather HARRY FOSKETT and wondered whether there were any other Foskett distant cousins in existance. He had died in 1920 as a result of "injuries" received in the Great War whilst serving in the Royal Navy; my father was only 4 at the time and had very little memory of him. 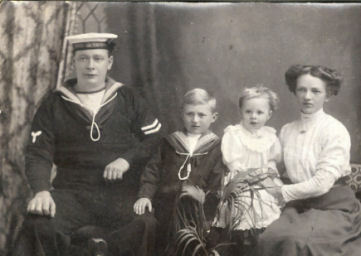 The family were very proud that prior to the war he had served on board the Royal Yacht, the "Victoria and Albert" for three years. My grandmother had raised the five children of the marriage on her own and unfortunately had also passed away by the time my interest was aroused. It didn't take me long to establish that Harry Foskett had been born in Winslow, Buckinghamshire in 1885, the son of William and Annie Mary (Warner) Foskett. He was one of 9 children but none of them, nor their descendants, were still living in the town. However, a chance meeting in the local pub (where else?) elicited the information that the family had moved to Hendon near London, and eventually I was successful in tracking the family down. Mission accomplished! It was then that I realised that the chance meeting in the pub had produced some rare tales of my great-grandfather William, nicknamed "Biggertop" Foskett, and before I knew it I was on the trail of him and his father, another William. Thus began the interest in genealogy, first extending to immediate relatives, then to all the Fosketts in Buckinghamshire, then all of England and then Worldwide. The result is a family tree on the Foskett side stretching back to 1405 in Great Horwood, Buckinghamshire, and although the family did move around the small area over the centuries, only 3 miles separate my grandfather's birthplace and the 1405 Foxcote family. However, there are still many Fosketts who as yet do not link onto that tree and I continue to pursue all avenues of research in order to establish relationships between the various branches - hence my recent explorations in the field of DNA. I am now retired and can indulge my family history interests to the full. I have one daughter and two delightful grandchildren: a grandson of 17 years and a grand-daughter of 20 months. I am lucky that they only live a mile away so I see them all regularly. Finally, I have been asked about the MBE. I use it to distinguish myself from at least another two Sandra J Smiths who live in my locality and a number of other Sandra Smiths with whom I am sometimes confused. For the benefit of American readers, it stands for Member of the British Empire, an award by the Queen for services rendered - in my case services to training. Whilst just recently the awards system has been brought into disrepute, I am extremely proud of my "gong" and will always remember with great pleasure my trip to Buckingham Palace in 1994 to receive it from the Queen in person.